According to the Environmental Protection Agency (EPA), the average american household wastes roughly 10,000 gallons of water a year through both known and unknown water leaks. That’s enough water to run an additional 270 loads of laundry! Worse yet, roughly 10 percent of US homes waste over 90 gallons of water per day. When you add all that up, it accounts to nearly 1 trillion gallons of wasted water by the US alone every year. Which is enough water to cover the annual usage of 11 million homes! But how can this be? Isn’t the average home owner smart enough to spot a dripping faucet or notice a dramatic spike in their water bill? In short yes, but most leaks are so small that they often go unnoticed. Especially given the relatively low cost of actual water usage on your monthly water bill. The most common areas where you’ll find these little trouble makers in your home are the bathroom, kitchen and laundry rooms. Just knowing where to look is a great start to finding and fixing these water leaks, but sometimes it’s a little easier said than done. So to help you figure out if your home has sprung a leak, we’ve complied a few easy tips. Check your water meter before and after a 2 hour period. During that time, try to refrain from using any water in your home. If the meter has gone up, then you’ve got a leak somewhere in the house. Monitor your winter water usage. 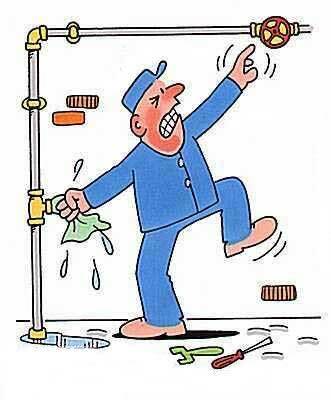 If a house hold of four is using more than 12,000 gallons per month, odds are there is a major water leak somewhere in the home. Compare your bills. If you haven’t had a major shift in your water usage habits, but your bill has gone up, you might have a water leak. Be sure to look at the actual water “usage” when comparing your monthly water bills. Look for water marks or discoloring in the paint on your ceilings. This is often caused by a leak from the floor above the water mark. Most likely a leaky sink, bathtub or drainage line is the culprit. If any of these examples sound familiar it might be a good idea to check around your house for a water leak. The good news, is that if you know where to look they shouldn’t be too hard to find. Try reading this article on leaks in and around your various sinks to get yourself started. Also, check out this article for a homemade drain cleaner, keeping your drains clean and clear is a great way to prevent leaks from forming in the first place. Photo courtesy of Painter Click.